The UN's Organization for the Prohibition of Chemical Weapons (OPCW) has completed its inspection work in Syria on time, and without any major hitch. All production facilities for chemical weapons have been destroyed. The US and its allies are satisfied that the chemical weapons Syria was believed to have possessed have been accounted for. Now all that is left is to destroy the chemical weapons, which include filled munitions and bulk storage of agents. Syria's government asked that this material be taken outside Syria and destroyed. Norway agreed to use its ships to remove the items. Albania was expected to perform the destruction, but major protests against the destruction ensued. Today it reneged on the deal. Albania!? Well, it did declare and destroy its own CW stockpile, years back. 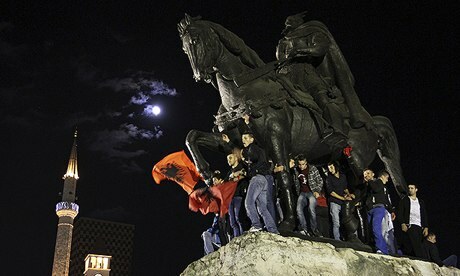 Thousands of Albanian protesters and Albania's new leader caving to them was a sudden, big surprise. ... "We don't have the infrastructure here to deal with the chemical weapons. We can't deal with our own stuff, let alone Syrian weapons," said 19-year-old architecture student Maria Pesha, echoing the fears of many residents. "We have no duty to obey anyone on this, NATO or the U.S."
Any destruction of Syria's weapons, wherever it happens, will be overseen by experts from the Hague-based OPCW, which won the Nobel Peace Prize this year for its efforts to eradicate poison gas and nerve agents around the world. A key meeting of the Organization for the Prohibition of Chemical Weapons (OPCW) - the international watchdog supervising the destruction - had adjourned for several hours in The Hague, awaiting Albania's decision. The mission to destroy Syria’s poison gas stockpile was dealt a serious blow Friday when Albania refused to host the destruction, but the global chemical weapons watchdog said it is still confident it can eradicate the arsenal outside Syria by the middle of next year.The surprise refusal by the small and impoverished Balkan country left open the question of where the Organization for the Prohibition of Chemical Weapons would send Syria’s estimated 1,300-ton arsenal, which includes mustard gas and sarin.